It was one of those seemingly random, insignificant events that happen every day in life. But, in this case, the effects still reverberate strongly for me every day. This was 6 years ago. I was President of a drug testing company that had been struggling. I’d been going to networking events, speaking in front of groups of prospects and even cold calling (just typing that makes me shudder!). We had a little bit of success with direct mail sales letters I’d written, but things were really slow. A few people had mentioned Google AdWords to me, but I hadn’t paid much attention to it. And I’d heard of this guy Perry Marshall who’d written a new book on Adwords. I’d been planning to pick it up at Amazon, but hadn’t gotten around to it yet. After leaving yet another sales meeting that didn’t result in any business, I had about an hour before I had to pick up my daughter from school. So I stopped at Borders and started browsing through the business books. There on the shelf was the Ultimate Guide to Google AdWords by Perry Marshall and Bryan Todd. I picked it up, plopped down on the couch and the rest of the world melted away. Before I knew it, I was 50 pages in and was late to get my daughter from school. I bought the book there on the spot (which was a big deal because the cheapskate in me wanted to save $4.59 and buy it on Amazon instead) and devoured the rest of it that night. The book changed the direction of my life forever. After reading it I set up a Google AdWords campaign for the drug testing business. By using AdWords for market research, I was very quickly and inexpensively able test out a hunch I had about a potential new market for the business. In less than a month that market turned into our most productive source of leads and sales. That realization, along with discovering how much more fun it is generating leads on the Internet with AdWords than trying to chase down drug users, led to me leaving the company and starting Words That Click 5 years ago this week. And it was the simple act of picking up Perry and Bryan’s book that started me on this whole wonderful adventure. 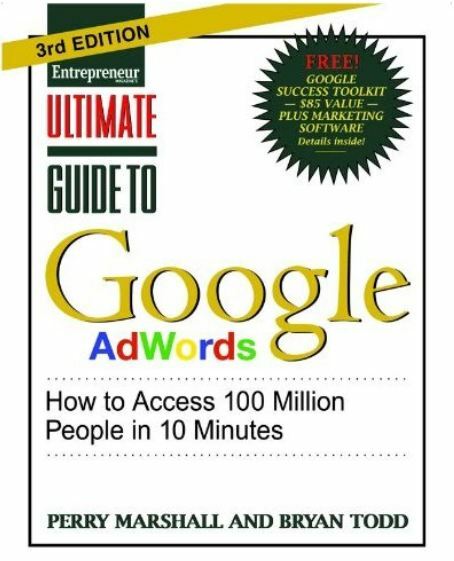 Whether you’re a newbie or experienced with AdWords, I’d strongly recommend picking it up at Amazon today. It’s only $16 and, you never know…it just might change your life. I went and picked up a copy of the second edition at the library yesterday. I’m about 1/3 of the way through it. It makes more sense now looking at what you were doing when you started our campaign last winter and why we had so much success right away. It’s dizzying to see how useful the tool can be if you know what you’re doing. You’re welcome, Tom. Glad you picked up the book!